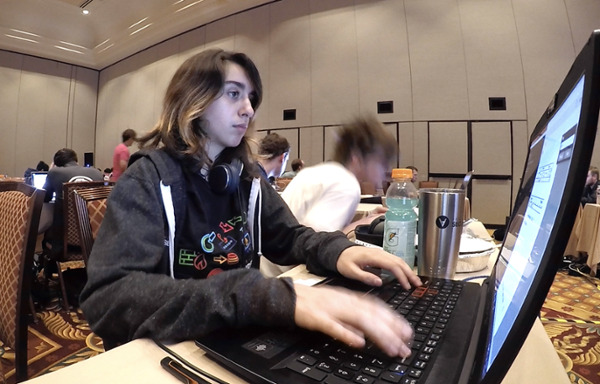 CyLab's Carolina Zarate hacks away at DefCon 2018. Carnegie Mellon's competitive hacking team, the Plaid Parliament of Pwning (PPP), placed 2nd overall at the 26th annual DefCon security conference hacking competition, widely considered the "World Series of Hacking." The competition was held August 9 – 12 in Las Vegas. PPP has won the competition four out of the last six years, placing 2nd in the years they did not win. This year, a team named DEFKOR00T, from South Korea, took 1st place. "Every year, DefCon is harder and harder to win," says Carolina Zarate, a member of PPP and a graduate student in Carnegie Mellon's Information Networking Institute. "This year was especially challenging because we were very prepared on defense, but this year's organizers removed a lot of aspects of defense from the competition. We had to pivot and have more people focus on attacks." Over the course of the 72-hour hacking spree, teams attempted to break into other teams' servers in pursuit of virtual "flags," earning them points, while simultaneously defending their own systems from other teams' attacks. This year's field of competitors represented over 10 different countries including Germany, France, China, and others. To earn a spot at DefCon, each team had to win a series of qualifying competitions held over the past 12 months. As per tradition, Carnegie Mellon's team was granted a spot for being last year's champions. Every year, DefCon is harder and harder to win. One of PPP's co-captains, Zach Wade, believes competitions like the DefCon are much more than just games. "This competition is practice for the kinds of attacks and the kinds of defenses we need in the real world," he says. "But it's also a coming together of the security community to make the world safer. It's passing ideas back and forth, in the form of a game, yes, but it's so that we can, as a world, be more secure." Wade was first introduced to PPP in high school, after placing 3rd overall in picoCTF, Carnegie Mellon's hacking competition for middle and high school students. Wade and his team beat thousands of other teams around the country. The Carnegie Mellon hacking team formed in 2009 and began competing in DefCon’s Capture the Flag competition in 2010. The team previously won the contest in 2013, 2014, 2016, and 2017.